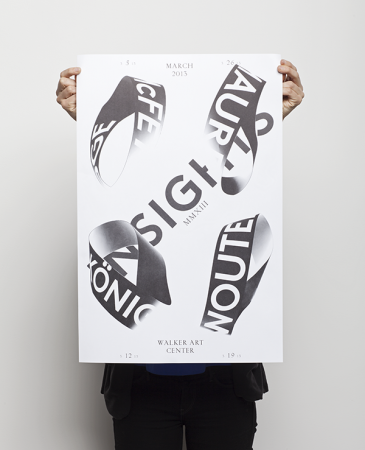 Above: The main print run of the poster was printed in CMYK. Pictured is one of five limited edition prints with combinations of ink channels turned on/off, here in black only. The identity for Insights: Surface Readings—as detailed here—employs a collection of Möbius strips to reference the commissioned contributions of lecturers Geoff McFetridge, Eike König, Job Wouters, and Luna Maurer to the various “surfaces” of the Walker. The poster was made by photographing printed strips of paper on a paper backdrop, the perfect “surface” for a printed piece. 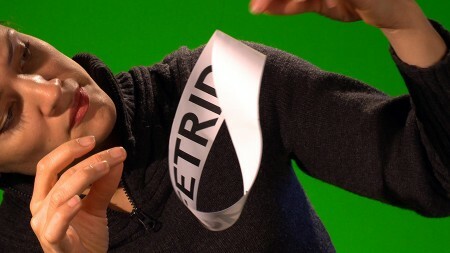 The trailer was made by filming strips on a green screen attached to a rotating rigging, and placing them on default Final Cut Pro backgrounds, which is again, a fitting surface for the medium. If you can’t make it for the talks in person, make sure to check out the live webcasts on the Walker Channel.